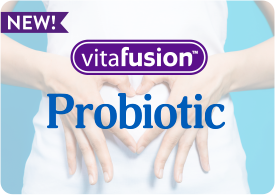 New from America’s #1 Gummy Vitamin Brand, vitafusion™ Organic D3 fuses together an essential nutrient with the best organic ingredients into a deliciously yummy gummy vitamin! Packed with 2000 IU (50 mcg) of vitamin D, also known as the sunshine vitamin, each serving of vitafusion Organic Vitamin D3 supports bones, muscles, and the immune system. 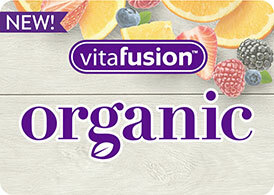 * vitafusion Organic D3 is a delicious blend of organic ingredients to support your health without anything extra. * Our organic D3 gummies are USDA certified and Non-GMO Project Verified so you know you’re really getting the good stuff! With no artificial ingredients or sweeteners, no dairy and no gluten, these non-gelatin gummies provide a vitamin experience you can feel good about.